It is a great pleasure for me to present OECD’s first Economic Survey of Israel and its first review of Israel’s labour-market and social policy. These reports help us to understand the policy settings in Israel in the context of its current accession process. We hope that their recommendations will be helpful for your own discussions, as you try to foster growth and development with a better distribution of their fruits. We would like to thank Ministers Yuval Steinitz, Gideon Sa’ar, Issac Herzog, Avishay Braverman and Benjamin Ben-Eliezer for their participation in the peer-review meetings for these reports and the many senior officials and experts who provided information and opinions in preparing them. In particular, we would like to thank Governor Fischer for his active support for both initiatives. Let me share with you some of the reflections and recommendations of these important reports. Israel’s economy has a number of fundamental strengths, most notably: a large high-tech sector, a large share of tertiary graduates in the workforce and a youthful and expanding population. For a long time the average rate of growth has been relatively high compared with most OECD economies, low and stable inflation has been well established and public debt has been brought down substantially. In contrast with most OECD countries, Israel has weathered the recent global downturn well. Indeed, GDP growth in 2009 is now estimated at 0.5% (that is in the positive side) contrary to what happened in many other countries and above the projections made by many, including ourselves. In light of this and the faster recovery apparently underway in many trading partners, our next projections to be released in May will almost certainly be revised up, with growth somewhere between 3 and 3 ½ % for 2010 and probably over 4% for 2011. The economy’s resilience during the global downturn was helped by broadly appropriate macroeconomic policy responses. The government’s fiscal package was fittingly modest. The fall-off in government revenues anyway provided an “automatic stabiliser” that partially offset the slowdown. However, it substantially increased the government’s budget deficit. The Bank of Israel’s response to the crisis and the prospective upturn has been timely and effective. We welcome the prospect of the long-discussed modernisation of the Bank of Israel law and we call for its speedy adoption. However, we do think the Bank should announce an early end to intervention in the foreign-exchange market because it risks confusing the markets as to the primacy of the inflation target. The lack of a significant housing bubble and limited holdings of toxic assets also helped Israel avoid a significant downturn. This undoubtedly reflects certain qualities in financial supervision and regulation. Still, we believe that supervisory bodies could be made more independent. In fact, the experience of our countries suggests that in the long run it would be more prudent to keep supervisory bodies at “arms length” from political interference. Specifically, the Ministry of Finance’s supervisory functions could be moved to an independent body. Taken together, these are all very positive elements. They support Israel’s comparative advantage as an investment platform in these very difficult global economic times. However, as it happens in other OECD countries like mine, Mexico, much of this progress has not yet reached an important part of the population. Particularly, there are still important social challenges ahead. Average living standards in Israel still have some way to go. There is still a considerable gap in relation to top-flight OECD countries. Consider one standard OECD measure, the incidence in total population of the people with disposable income less than half the median. Using this standard, the overall poverty rate is high -- at 20% it is higher than in any OECD country and strongly concentrated. About half of all Arabs are in poverty and 60% of the Haredim. With almost half of all children starting primary school belonging to these groups, there is an urgent need to tackle the causes of this poverty. It is also due to the low levels of education attainment in both groups. Part of the roots of poverty lie in the low labour-market participation of Arabs, in particular Arab women, and of Haredim men. In both populations there is a comparatively high share of low-wage workers. The elders are another particular group affected by poverty: 23% of the elderly in Israel are poor, compared with the OECD average of 13.5%. This can be explained by the fact that the Israeli pension combines a low basic pension with a strict means-tested supplement. Since many low-income retirees are not eligible for the latter supplement, a less strict application of the means test should be considered. Israel devotes a relatively high share of GDP to education (around 8%), even higher than the OECD average (6%), but its education system still faces important challenges both in terms of its complexity and reach. Policymakers can help by pushing ahead with reforms to education. Human capital is fundamental to economic growth. And, investment in education can also narrow gaps in society, enhancing social cohesion. Reforms to mainstream primary and lower-secondary education are proceeding well. The New Horizon programme is a welcome development, and we encourage upper-secondary school teachers to accept a similar package. However, further work is required to raise the education outcomes of Arab-Israeli children. And there are tough challenges in encouraging change in Ultra-orthodox schooling. No country can afford, either economically or socially, large numbers of children not acquiring basic numerical and literacy skills for everyday life and work. Also, reforms in tertiary education have apparently stalled and the false start of the Shochat reform was unfortunate. Education is the best way to empower our people to make the most of globalisation. Israel knows this very well. a) There is evidence that ethnicity affects employment and earnings outcomes of minorities, of which Arabs are the largest group. The government should lead the way in stamping out discriminatory practices, by fully implementing existing public-sector employment quotas for minorities, enhancing equal-career chances for all its employees and favouring private-sector contractors who promote equal opportunity. b) Enforcement of existing labour laws is very slack. This puts workers not covered by collective agreements, and especially low-paid workers and foreign workers, in a precarious situation. Increasing staff and resources of the Labour Inspectorate, as well as sanctions on employers not respecting their legal obligations towards their workers, would go a long way to ensuring respect for decent working conditions. c) Foreign workers constitute a cheap and growing part of the labour force. These foreigners are often exploited by temporary-work agencies, who charge them high illegal fees, and by employers who frequently violate the legal minimum employment standards. Our report argues for greater transparency in quota setting and the use of “labour-market tests” in hiring; that is, employers should be required to advertise jobs in Israel first, and hires from outside the country must be justifiable with reference to the skills of the individual in question. 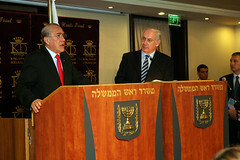 Many OECD countries have such mechanisms in place and can provide interesting experiences of good practices for Israel. Wider business opportunities are also important to spur inclusiveness, particularly as they can help foster the entrepreneurial and innovation capacities of youth generations. Israel is assisting businesses and promoting market competition in ways that are familiar to many OECD countries. Nevertheless, red tape in the Israeli economy is still overly burdensome. Policymakers can help Israel towards sustainable and balanced growth through improving business policies. Red tape is onerous for business, and the effectiveness of business tax breaks and subsidies needs close monitoring. There remain weaknesses in the structure and oversight of some network industries, notably the electricity sector. The Economic Survey devotes a whole very interesting chapter to this crucial challenge. To conclude, our reports underscore that even with “smart policies”, cutting poverty through expanding labour force participation among underrepresented groups and making work pay will require more resources. In international comparison, public social spending is low at 16% of GDP against 21% for the OECD average and so making Israel a more inclusive society with lower poverty and higher employment is worth this extra social effort, even if financing it may be challenging. Israel’s economy is working well and has accumulated many success stories, with a remarkable progress in becoming and innovation platform, or in the words of the recent book by Dan Senor and Saul Singer, “A Start-Up Nation”. But further improvements could be achieved to ensure that the benefits of economic growth are shared widely, thus reducing the marked disparities that characterize the Israeli landscape nowadays. In the tradition of the OECD work method, our recommendations are strongly evidence-based, not binding and not "one size fits all" - OECD recognises that challenges can differ, as well as the ways to respond to them. They were prepared in a spirit of cooperation. For almost fifty years now, OECD countries have worked together to improve their policies, through a system of permanent dialogue, based on mutual learning and trusting -- the key values of this Organisation. We very much hope that our reports help to enrich the policy debate in Israel.